New responsive design features 'Personas' groupings for Acoustic, Electric, Bass, Keyboard, Pro Audio and Recording on the home page and more improvements. Radial Engineering announces the launch of its new website with several features that improve user experience while maintaining the information rich content that Radial users have come to expect and rely upon. Users of the site will immediately appreciate the streamlined and simplified look which, combined with robust back-end features, will better serve the user and make it easier to find what they are looking for. 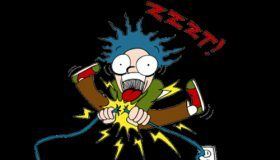 The site is also optimized to be responsive to all devices – whether accessed by phone, tablet or laptop, users will all enjoy the same upgraded experience. ‘Personas’ on the home page include: Acoustic, Electric, Bass, Keyboard, Pro Audio and Recording. Once a persona is selected, all of the applicable products are revealed. A ‘quick view’ of each product allows users to glean product features before choosing to dive deeper into the associated information. This will be particularly helpful for Radial dealers and media who are seeking part numbers, high resolution images and other resources. A convenient search feature with an auto complete makes it easy to immediately find products. 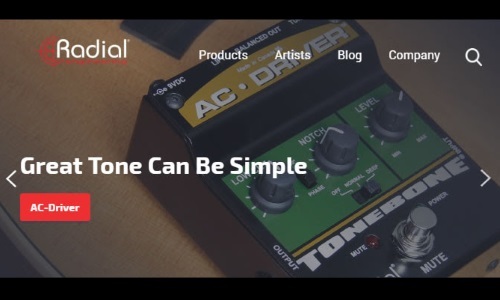 Finally, Radial’s Tonebone line, which previously had its own website, has now been integrated in the Radial website. 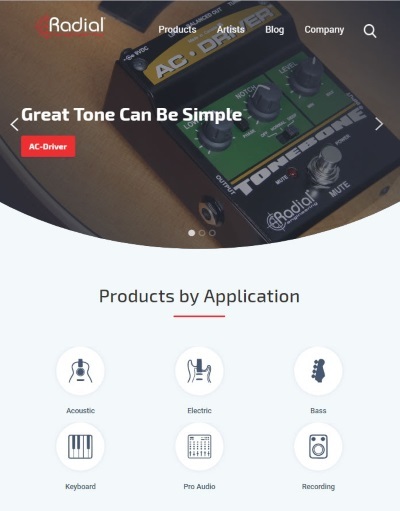 Products are color coded red for Radial and blue for Tonebone.